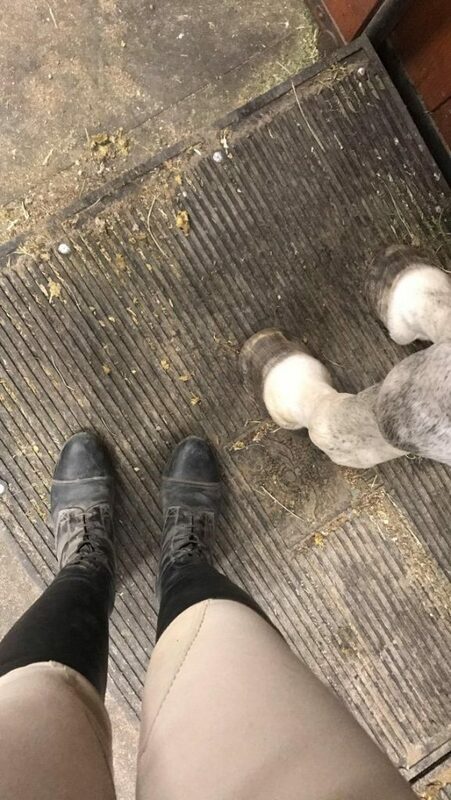 To help prepare for her catch-ride in an upcoming George Morris clinic, Meagan DeLisle put herself through a riding boot camp last week, and lived to tell the tale. Riding in a George Morris clinic is scary enough, but I promise that doing it on a catch ride definitely adds to the pressure. 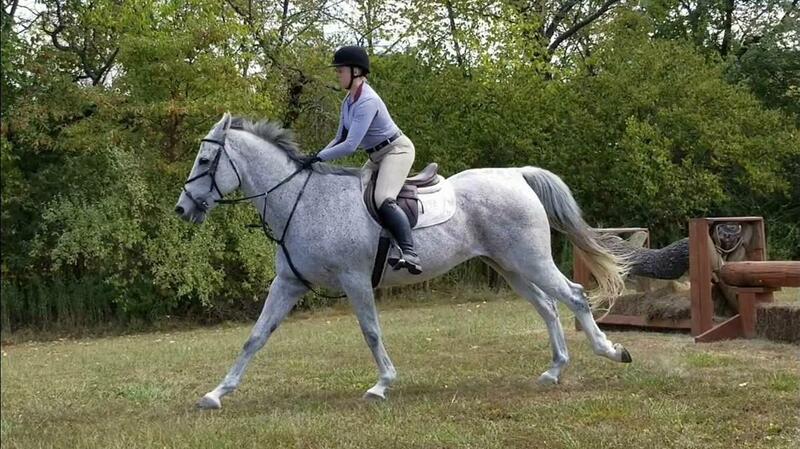 After riding my clinic horse Point South for the first time at a horse show, I knew I needed more time to familiarize myself with the type of ride he requires so I would be on my A-game at the clinic. Any additional time in the saddle would help me tie together all of the loose ends so I could hopefully avoid being the least prepared one in front of George. 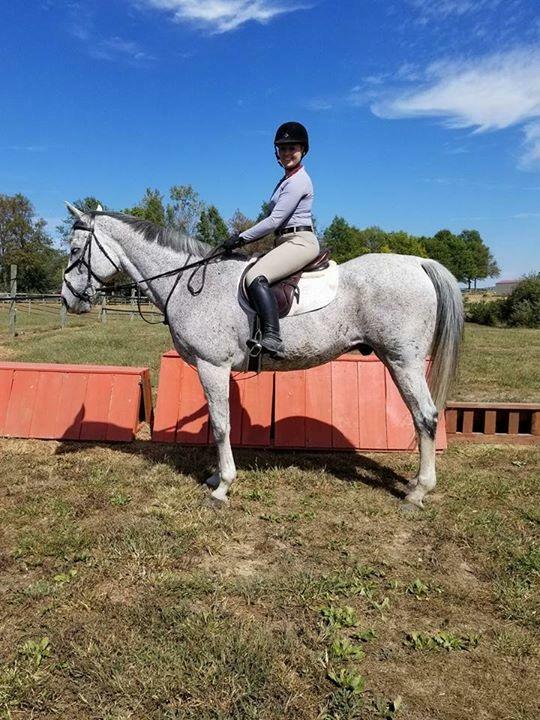 So after two very successful rides at home, I cashed in some vacation time and made plans to travel to Briarstone Riding Academy in Waterloo, Illinois to ride South with his owner and trainer, Jena Guldner. With Briarstone being two and a half hours away, I left my house promptly at 7 AM on a Friday morning so I could arrive early enough for plenty of ride time. As I pulled onto the charming Briarstone Riding Academy property I immediately felt at home. While it is smaller than my home base, it doesn’t lack in charm and friendly atmosphere — or talented riders. Riders of all ages come and go at all hours of the day for lessons and hacks on their immaculately-kept horses. Jena was ready to get straight to work, so I tossed South on the Theraplate for a quick 15 minutes of therapy prior to tacking him up. The first thing Jena addressed was my lower leg and getting my calf on to reduce the way it would swing. Then we worked on growing tall in the saddle, using my belly button as a guideline to stretch my chest up and tall. My posture is less than perfect — I naturally slouch all the time so this was more of a muscle memory issue for me. We did lots of circles at the trot and canter to help me carry South in a frame and adjust my posture. 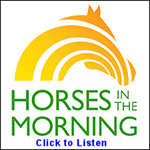 Saturday we had an early morning ride where we perfected the posture issues from Friday and also introduced jumping. Saturday morning was excellent: I felt so in sync with South and had established a connection with him where I could go long or hold back and ask for the add without a fuss. Saturday evening, on the other hand, brought on a whole new set of challenges. First of all, we tacked up at 8 PM in the dark with just three arena lights shining on one half of the arena. Let me tell you, Jena is not afraid to work all day long if she needs to. We flatted and after she was confident in the improvements I had made, she set up a small crossrail to 2’6” oxer line for us to hop over. I am not sure if it was my concern about going in the dark or if I was just growing tired from the amount of rides I had that weekend, but I was not on my game that evening. After the sixth or seventh time over the line I realized my posture was atrocious and the fear of not being ready began to creep back up into my brain. Jena didn’t give me much time to question myself, however, and required that I go again and again and again until I got it right. Finally, after watching some video of the way I was carrying myself over the fences I managed to pull out two great rides and allow South the evening off. Sunday, I woke a bundle of nerves — it was cross country schooling day. I had never gone cross country schooling before, all though my one-time stint as a foxhunter somewhat prepared me for what I might see. Don’t get me wrong, I have deep-seated respect for eventers but I lack the bold nature required to gallop towards fences that do not break down should you take a poor spot to the fence. As I stood on the Theraplate with South that morning (by this point my knees felt like kernels of popcorn were exploding in my joints), I tried to remember that my anxiety would trigger anxiety in South as well. Zen — I had to be zen. Avalon Farm in Illinois is a quaint pony club barn with exceptional cross country fields tucked away in its rolling hills. South was one of the more seasoned horses we took with us that day and his attitude reflected his years of experience. He practically fell asleep at the trailer as I tacked him up, which helped ease the butterflies that were throwing a mosh pit in my tummy. Jumps of all sizes dotted the fields: coops, ditches, trahkeners and many others that I didn’t know the technical name for. 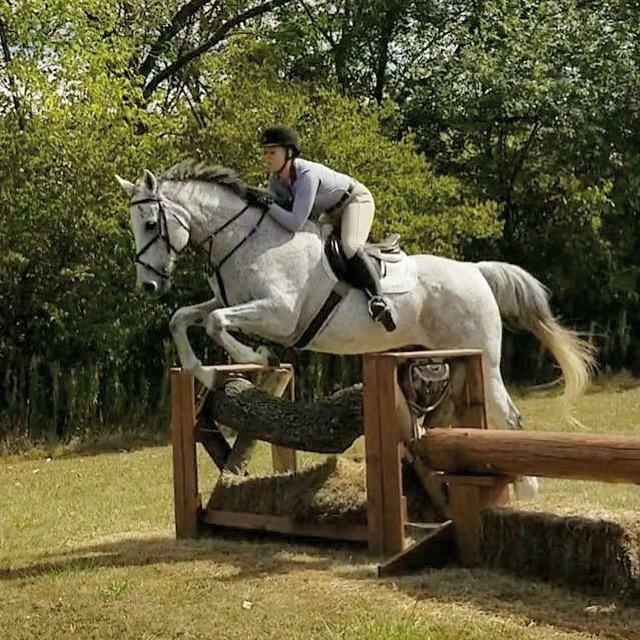 We started small, trotting over teeny tiny logs and a little stair step that more suited my style but I knew that I needed to school larger fences in preparation for the clinic which would be hosted in the Robertson’s jump field. Our crew of riders was the best support team I could have asked for that day. We laughed and joked and cheered for one another throughout the entire day. When one of us grew concerned about a particular fence, we would play that fear off and twist it into something we could giggle about to lighten the load. Jena’s adorable daughter, Nicki, is originally from China and I learned that day that the word haipa translates to scary in English. When one of us were a little concerned about a fence we would simply giggle and whisper haipa to one another and we would rally together to lift that rider up. One fence in particular that was verrrryyyy haipa for me was a large drooping log that faced down a hill. I struggled the first two attempts with my position over the fence upon the landing and allowing South to do his job. Thankfully, as I cantered to it the final time one of the girls chimed up and said “bo haipa,” meaning not scary, and I sat up tall, added leg, and went for it resulting in the best fence of the day. 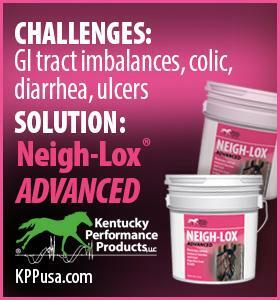 We galloped off with a giant smile on my face and feeling confident that I was prepared for the clinic. While I have been doing tons of physical preparation, I also needed to do some material preparation as well. I took a quick trip into St. Louis to stop at The Tack Trunk and shop for a few George-approved essentials on the clinic instruction. Then it was onto my outfits. Riding with George requires clean, classical clothing which is not necessarily my forte. I rock non-traditionally colored breeches on the daily, so I invested in an additional pair of tan Tailored Sportsman breeches so I would have one pair of tan knee-patch breeches for each day of the clinic. In addition to plain breeches, I began hunting for basic colored and quality sun shirts that I could finish my outfits with. A tip told me that George prefers the traditional colors such as navy, black, white, burgundy, and hunter green. I selected a nice dark blue Kastel sunshirt to round out my shopping spree for the day. With boot camp drawn to a close and my outfits prepared, I left Briarstone feeling more prepared than ever. Sure, I still have my concerns, but honestly my plan is to go into this clinic as the best student that I can be. My hope is that in the areas where I may not be as prepared as others that my positive attitude and willingness to learn will show George my passion for this sport and respect for his teachings. I finished his book Unrelenting and picked up a copy of Hunter Seat Equitation so I could have a crash course on George-isms I am sure I will hear during the clinic. For just having 3 weeks to plan, I feel like I have done all that I could do with the time I was allowed. Next week I will head to the clinic one day early for a last-minute lesson with Brody Robertson in the jump field prior to the day my dream begins. I am bouncing back and forth between excitement and feeling like I might throw up at any second, but I continue to have my spirits lifted by those around me who are in support of this crazy dream of mine. All of this love has definitely helped to get me on the right mindset for my dream come true.